Icon Canadian frame builder Paul Brodie will be holding a two week, hands-on course at the University of the Fraser Valley in Abbotsford. Learn the art of steel frame-building in this two-week course from the man who helped get it all started on the West Coast - Paul Brodie. 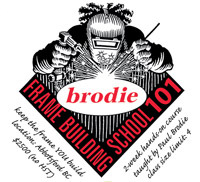 This is a hands-on course using the same jigs and fixtures that helped to create over 4000 hand-built Brodie frames. Design your own hard-tail frame, and be an integral part of its creation. Graduate from the course with knowledge and understanding of the process. This course is limited to four participants. The course includes a brief MTB history, frame design/geometry, tube selection, full-scale drawing, shop safety, tube-mitring, jigs and fixtures, welding/brazing, frame alignment, and finish work. When you begin, you'll need to have a clear idea of what style of bike you wish to build, and which front fork style you wish to use. For more information, and to sign up for the course, visit www.ufv.ca/bicycleframe, or contact karen.massier@ufv.ca.